Create a Thanksgiving Platter to serve treats. 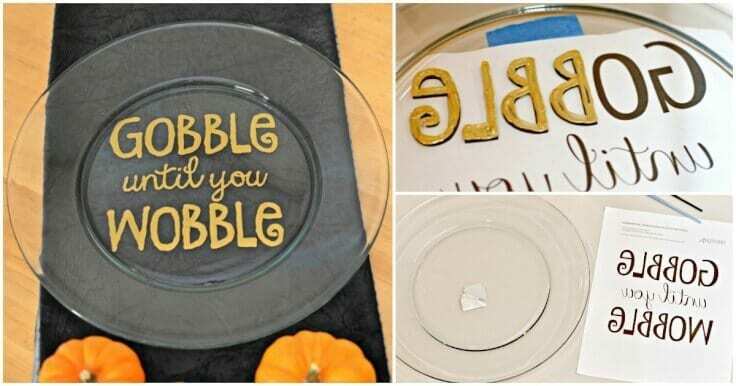 Use this free Gobble Until You Wobble design to paint a plate as a DIY hostess gift. Today we’re sharing how to create an Easy DIY Thanksgiving Gift to serve cookies or other treats on for Turkey Day. 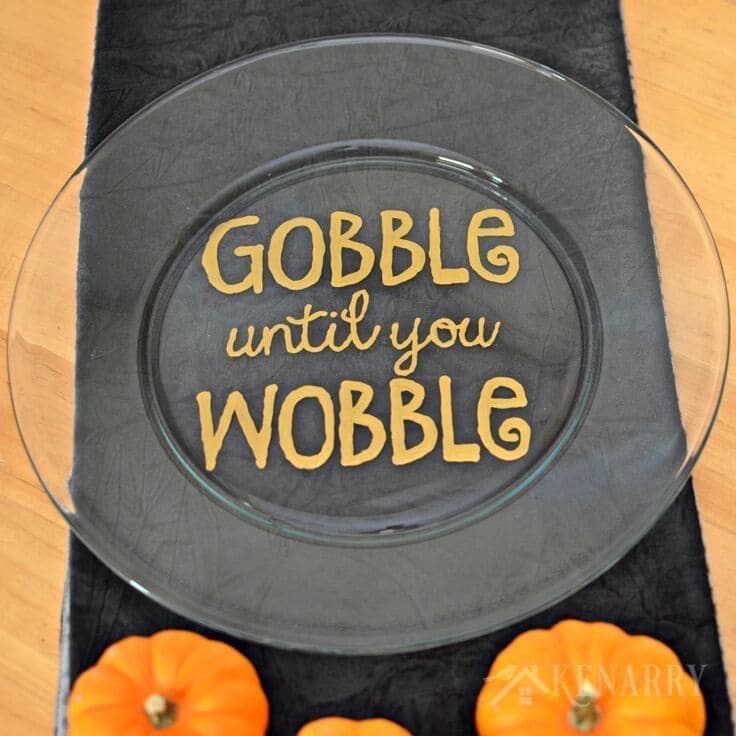 It’s a really easy craft when you use this free “Gobble Until You Wobble” design template to paint a large plate. It would also work great as a DIY hostess gift. Last week I shared how my younger brother and his partner do an amazing job of hosting our family for Thanksgiving. 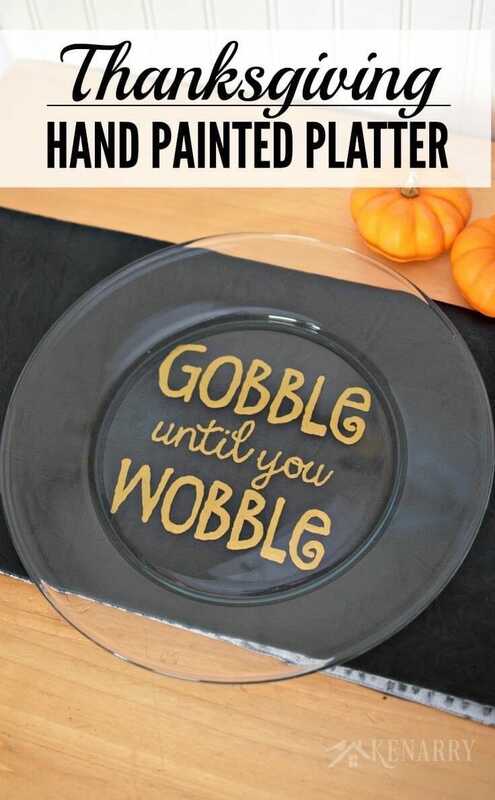 They think of everything from butter shaped like a turkey to having kids’ crafts like Handprint Turkey Shirts to keep my boys busy and entertained. I wanted to create something special to thank them for being such wonderful hosts. I immediately thought of making them an easy DIY Thanksgiving platter they could use to serve pies, tarts, cookies and other treats. Hand painting glassware is one of my favorite crafts. 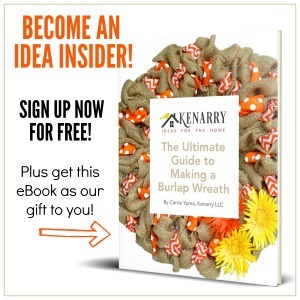 It’s a really easy and inexpensive way to personalize a DIY gift for friends and family at the holidays. A Thanksgiving platter like this would actually go really well with a set of fall wine glasses and appetizer plates like I recently made for a raffle at our annual Women’s Service Day event. Remove any stickers from the platter. Wash and dry it thoroughly so you have a clean surface for painting. I used Goo Gone to remove any sticky residue and then ran the platter through my dish washer. 2. Print the design for the Thanksgiving platter. 3. Affix the design to the Thankgiving platter. To make the Thanksgiving platter food safe, you’re going to actually be painting on the bottom of the platter rather than the top. 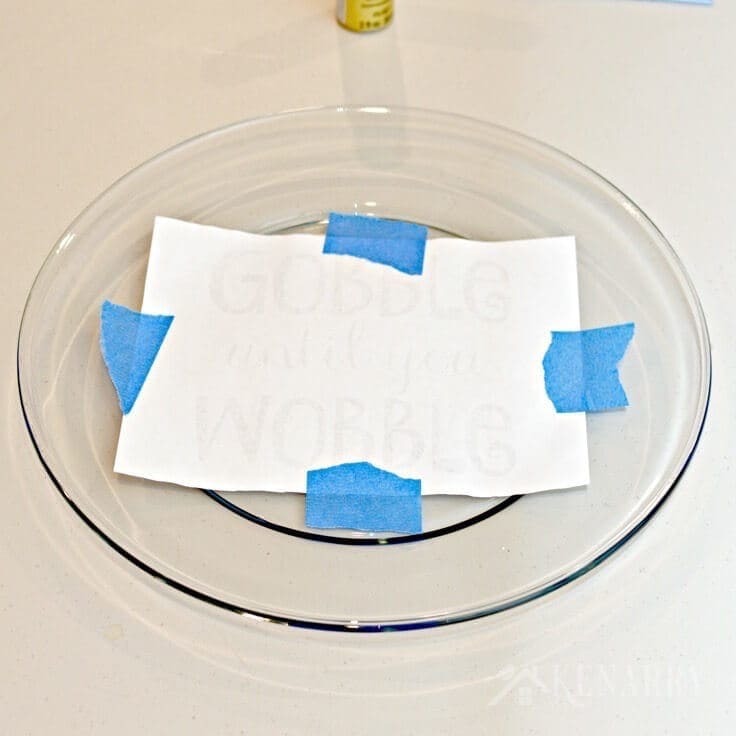 To make your text appear correctly once you’re done, you use painter’s tape to attach the backwards text template to the top of the Thanksgiving platter. 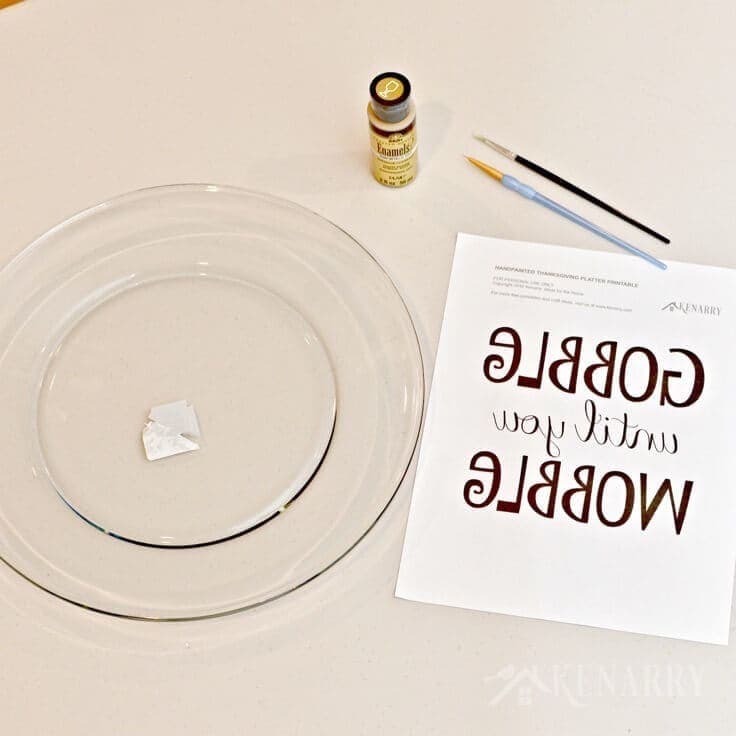 Then when you flip the platter upside down, you’ll see the backwards design through the glass so you can trace it with paint in the next step. 4. Trace the letters with paint. Flip the platter upside down so you’re looking at the bottom of the platter. Using a small paint brush, carefully trace over the letters in the design on the bottom of the platter. The design is taped to the top of the platter so you’re not directly painting on it. 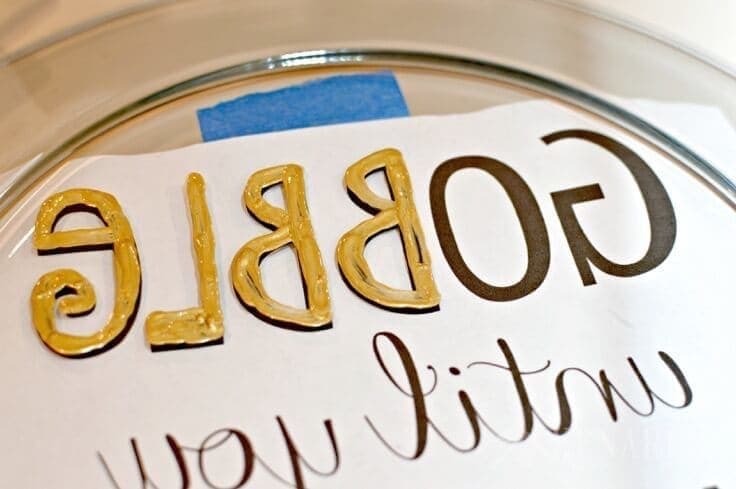 You’ll see in the photo I used a gold enamel paint, but you can use any gloss enamel craft paint color for this project. 5. Allow the Thanksgiving platter to dry. You may need to use a few coats of paint to get the desired coverage you want on the Thanksgiving platter. Be sure to allow enough time for the Thanksgiving platter to dry between coats. You can also use a blow dryer to speed up the drying process. 6. Cure the paint on the Thanksgiving platter. Method 1: Air Dry. Let the Thanksgiving platter air dry for 21 days. Method 2: Bake in the Oven. Put the Thanksgiving platter on a metal baking sheet and place on a low rack in the oven. Heat the oven to 350 degrees. Bake the Thanksgiving platter for 30 minutes. Turn the oven off and allow the Thanksgiving platter to cool naturally with the oven before removing it. IMPORTANT: YOU MUST PUT THE THANKSGIVING PLATTER IN THE OVEN BEFORE YOU TURN IT ON TO PREVENT THE PLATTER FROM BREAKING. Once the paint has cured on the Thanksgiving platter, it is dishwasher safe. This is such a fun and great idea. I love it and love this idea to make dessert plates. Adorable! I would love it if you would share this idea at a link party I am co-hosting tomorrow, Sunday at 4 pm, eastern time. I hope to see you there. Have a great weekend. Vanessa, thanks for visiting us and for the invitation to your party! Hi Carrie! 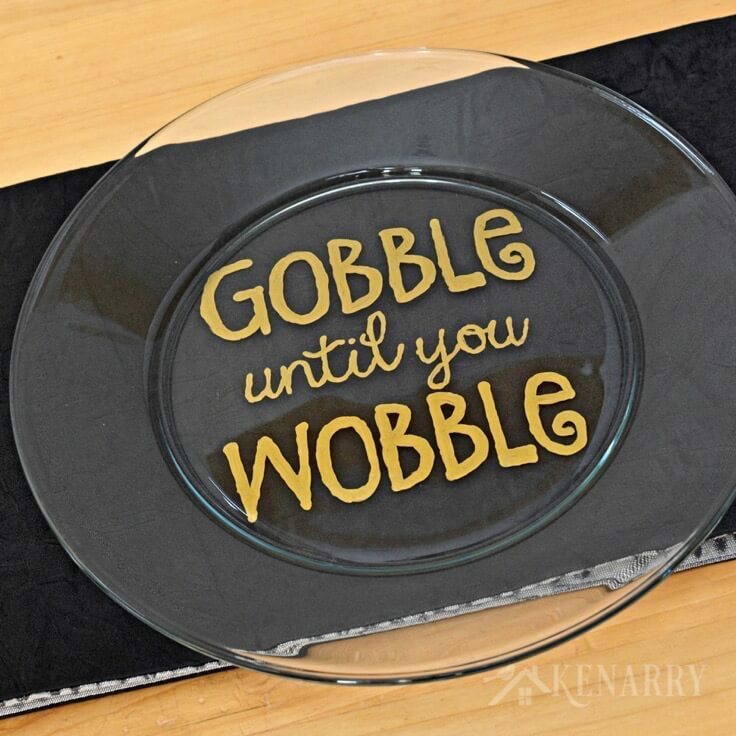 What a fun plate to have at thanksgiving! Thanks Lori! So glad you came by to see us. I love this!! 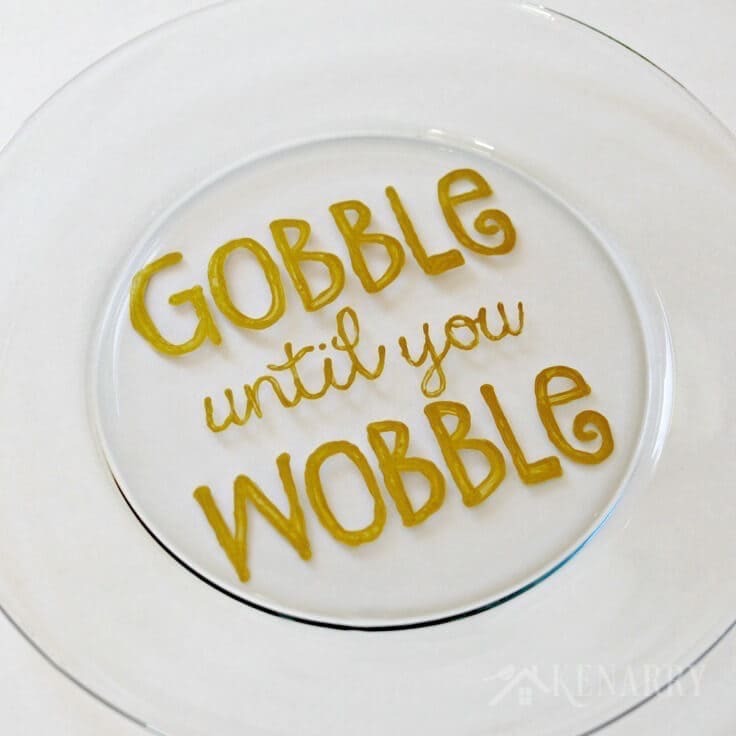 Such a fun plate to have at Thanksgiving! Thank you, Eden! We think so too. THIS is an awesome idea! I’m definitely thinking about doing this for the Christmas holidays! Thanks! Also, cheers for people like your brother! My sister in law is a hostess like that– she always thinks of everything! Thanks Kimberly! Isn’t it fun to have someone in the family who goes above and beyond to make the holidays special?